I've seen plenty of pictures of (or from) cameras strapped to the outside of your aircraft. My question is, what have you (a) strapped to the outside of your aircraft, (b) wanted to strap to the outside of your aircraft, or (c) seen strapped to the outside of your aircraft. This presented some unique challenges but we got it worked out. The gentleman holding it is a 701 builder that wished he had the same mod. Great! Presume that they're mounted on each strut. Will come in handy IF you see the drone that's about to hit you first. Well worth the weight penalty you pay- the M2 is a great persuader when in a dispute. You can be a mini Spooky- the C-130 all decked out for gun runs. Those things settle an argument fast. Here are some photos of mountain bikes strapped to struts (or a purpose built rack)- would be handy to have a ride once you land. You just point it into the wind. A great caption would be "World's most expensive bike rack". I'd hang the bike under the strut instead of on top, but there's more than one way to skin a cat (if cat skinning is your kind of thing). I'm contemplating adding a slot at the top of the baggage compartment wall (of a 750) for a fishing rod tube. It would be a compartment that extends back into the fuselage aways. Wouldn't hold a lot of weight- just a couple light fly rods. Looks like the C185 even has the speed mud flaps I want to try once I get a plane in the air (not full wheel pants, just a mud flap to break up the downwind air eddy). I also plan on some camera mounts- maybe using nut plates to be able to detach when not in use. I'd like to share my experiences with others to inspire and motivate them as many others have for me. Youtube is a great tool in the world today. How did the 750 perform? How much did the bike weigh? Did you have another bike on the other wing to balance it? Would taking the seat and wheels or tires off be worth the effort to reduce drag? What edition "750" izzat? Doesn't look like my edition 2. The "Saving . . ." is an artifact of the site system. When I edited, the system saved only that, and trashed my post. Is this a software issue? 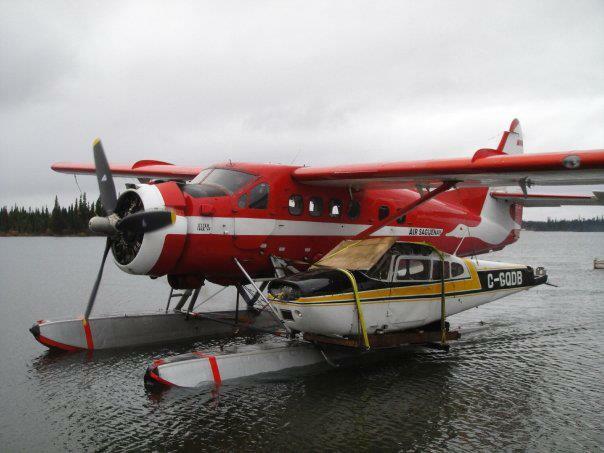 It looks like a Cub and a C-185. I just got the pictures from the internet. I doubt one bike would make a lot of difference in weight- put it on the lower fuel side of the plane, or take one per side if you have a passenger to ride the other. Average weight of a mountain bike is about 26 pounds- less for a road bike, so you'd have to watch your gross if taking full fuel and 2 passengers, but at least it's handing under the CG. You could take the wheels off, but you wouldn't set a speed record with it handing there anyway, so I'd just leave them on. I'll try it when I get my plane built, but that will be a few years down the road. Adam, those pics are awesome! I gotta share it on Fb! Know I asked the question. Someone strapped a spare airplane to their airplane!